Made from high quality material, this Hozelock Jet Spray gun comes with a quick connect male connector for fast changing between devices and secure, drip free attachment. 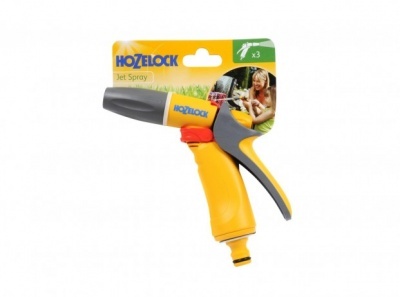 This Jet Spray gun features a soft to touch rear trigger for comfortable operation. The trigger can be locked in position for extra comfort during prolonged use. And an easy to use flow adjuster gives the user complete control over the water spray.